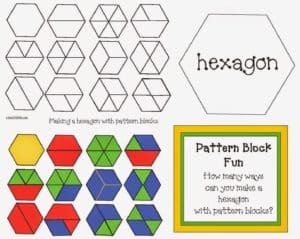 Do your students play with pattern blocks? They are one of my kiddos’ favorite math manipulatives. With that in mind, I designed these cute “Pattern Block Pals”, which will help children learn the names of the shapes. They’re a simple way to review colors as well. 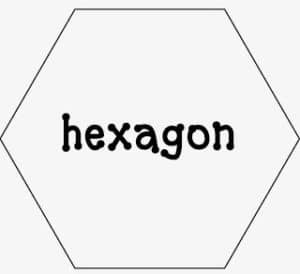 The packet includes plain shapes, shapes with the shape word, plus shapes with faces. Pick your favorite type of pattern, or give children a choice. The gloved-hands and sneakers add to the cuteness factor, while the accordion-folded “legs” provide great fine motor practice, which helps strengthen finger muscles. Completed projects make an adorable “Shaping Up!” bulletin board. 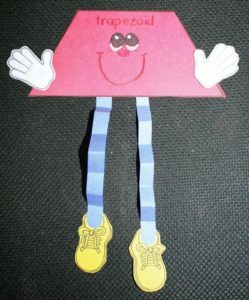 Click on the link to zip on over to my blog, where the Pattern Block Pals are today’s featured FREEBIE. « Teach Math Vocabulary with this Froggy Freebie!